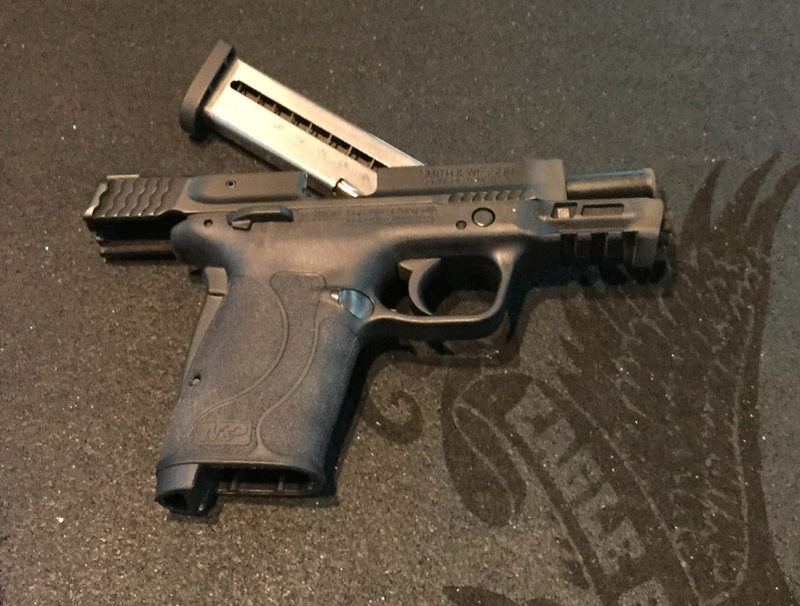 Shooting Review – The M&P 380 Shield EZ | Eagle Gun Range Inc.
Why make a low-capacity, mid-sized pistol chambered in .380? This was my first question when I saw the specs of the 380 Shield EZ. Well, Smith & Wesson are no dummies so there had to be some logic behind their move here. What I found when I got my hands on the gun and a few rounds downrange was that they’ve got something rather interesting here. The frame is seemingly larger than would be required for this capacity and chambering, but there is a benefit. The capacity is seemingly lower than would be expected for a frame of this size, but there is a benefit. The result is an easy to hold, easy to manipulate, lightweight pistol that shoots a defensive round but feels like a .22 cal gun. Hrm. 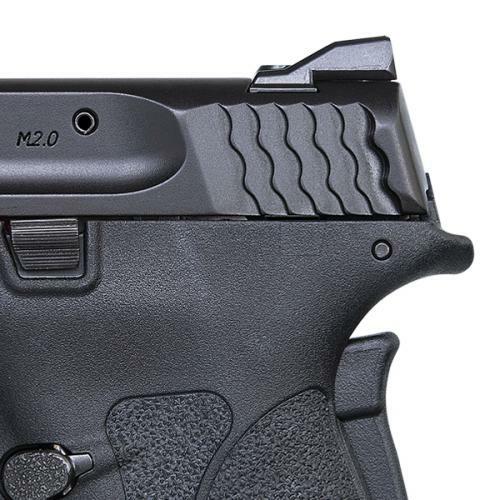 Why Consider the M&P 380 Shield EZ? 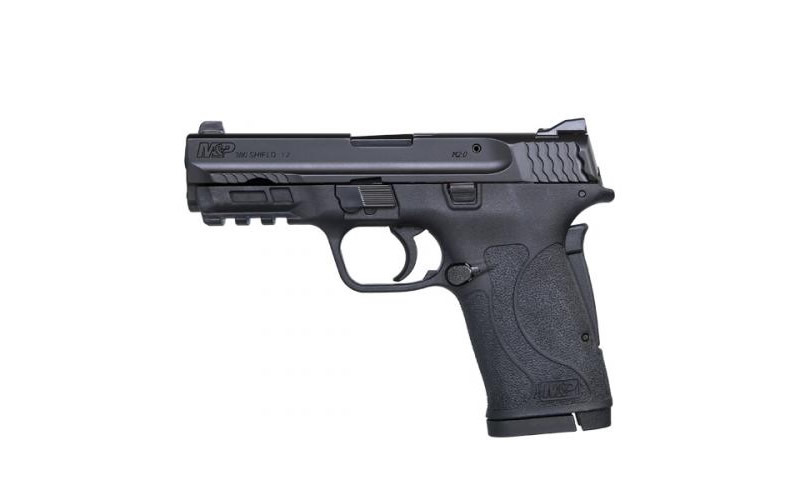 The M&P 380 Shield EZ is a compact pistol purpose made for carry and for home defense. Though compact, it is longer and taller than the 9mm Shield most of us know, so there is more of the gun to hold onto. One of the primary features of the pistol is its easy-to-rack slide, seemingly tailor made for people without strong hands. 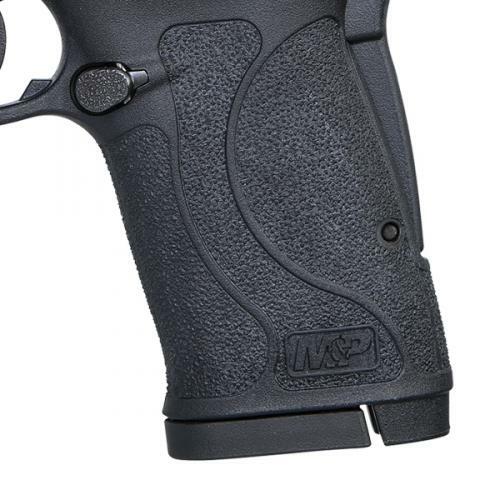 Another feature worth consideration is the grip safety; a feature not often found on compact pistols. If you’re someone who values an extra layer of safety, the 380 Sheild EZ might just be the ticket for you. Finally, you might consider this pistol for its appealing price. The combination of the slightly larger frame and the slightly softer round make this pistol a joy to shoot and very easy with which to be very accurate…all so long as you don’t mind the minimal defensive ballistics of the .380 round. Note that the model I’m evaluating here has ambi thumb safety levers. Shooting the 380 Shield is like shooting a .22 pistol. No kidding, the recoil impulse is almost nonexistent so the pistol is very easy to control and to maintain a high degree of accuracy. While some .380 pistols are a bit snappy, due to their subcompact configuration, this Shield model has both the size and weight necessary to mitigate all snappiness. This is an easy pistol to shoot. The frame is larger than a typical Shield, but smaller than, say, the M&P 9. This mid-sized frame offers plenty to hold onto and allows the controls to be very comfortably positioned. I had no problem running the gun for on/off safety, magazine ejection and reloads, and locking the slide back. It all felt very natural and comfortable. The trigger is actually quite nice and has a very short and crisp reset, but somehow running it fast did not go as smoothly as I thought it should. I did a few strings of rapid fire during which I wasn’t able to keep the gun as still as it seemed I should for being such a soft shooter. I chalk this up to my being familiar with my EDC gun and this slightly altered geometry of this 380 Shield EZ threw a wrench in my gears. Surely with a bit of practice shooting fast drills would become smoother. Mostly, though, I just enjoyed shooting this gun. No kidding, outside of a precision .22 this is the softest gun I’ve ever shot. So fun. The 380 Shield is not at all heavy and lighter than even the smaller Shield 9mm. Though it is named for the Shield, it feels less like that model and more like the M&P 9 in the hand. It’s a single stack gun, but the grip is not overly thin. For my medium-sized hands, it was quite comfortable. And as mentioned earlier, the controls were easy to get to and to manipulate. The 8+1 capacity is a bit low for a .380 of this size, but being a single stack gun keeps the frame width down and facilitates a more concealable gun. Controlling the 380 Shield EZ is about as easy as it gets. Even older children and new shooters should do quite well keeping this pistol under control. The 380 Shield EZ looks like a typical striker-fired gun, but it’s not. It has an internal hammer and that brings consequences to both the trigger (smooth) and the recoil spring weight you feel when racking the slide (softer), since there is no striker to load up. The most conspicuous feature of the 380 Shield EZ is the grip safety. It’s a large component that disappears when the frame is gripped. I found that I never even noticed the grip safety fin so it was a non factor in my working with the gun. The model I used had the ambi thumb safety levers. Though I always believe such components to be useless or even dangerous on a pistol, I did spend time engaging and disengaging the levers during shooting. They seemed stiff enough to be properly tactile and easy enough to manipulate. The 380 Shield EZ can come without the manual safety levers if you prefer that model (and I hope you do). The sights are 3-dot steel and the rear sight is drift adjustable. I had no trouble picking up the sights and maintaining a good sight picture during shooting strings. The slide has good serrations, but with the addition of some “wings” on the rear of the slide, I guess to assist with slide racking. I found them entirely unnecessary, but they also didn’t get in my way as some similar components on other guns have. These are the wings at the rear of the slide. Not necessary, but not a problem, found. As mentioned before, the trigger is darn good and contributed positively to accurate shooting. I did not measure its weight, but it seemed to break at around 5 – 5.5 pounds. I’m a fan and wish my Glocks had as good a trigger. The frame is nicely textured and plenty comfortable for my medium-sized hands. The grip texture is rather mild, but still grippy. Most folks will still want to stipple. Interestingly, the magazines have side tabs very similar to those found on .22 magazines so that you can if you wish pull down to allow for easier loading of rounds into the magazine. I didn’t find the need to do so, but they work just fine. This is a relatively lightweight pistol that carries relatively lightweight ammo, which amounts to a mid-sized gun that would be very comfortable to carry around concealed all day. Virtually anyone could rack the slide to lock open or to load. The soft-shooting, highly controllable characteristics make shooting the pistol a very appealing prospect. The trigger is excellent and the grip safety offers an unobtrusive layer of mistake prevention. Also, the price is comparatively very nice. The .380 round is not optimal for defensive use, but it is serviceable; especially during warmer months when clothes are not thickly layered. Eight rounds in the magazine is a bit anemic for a carry gun, especially with such a small caliber and the overall package is a bit large for an 8+1 capacity (only 1 more round than the smaller 9mm model???). There is nothing spectacular about this gun’s ergonomics, but it works and feels just fine. Perhaps the most shootable pistol I’ve ever laid my hands on. I found it to be very accurate and very easy to maintain that accuracy! The 380 Shield EZ is thin enough and small enough to conceal quite well, though not as well as its smaller cousin, the M&P Shield 9mm. Essentially what Smith & Wesson has done here is create an easy to manipulate, easy to shoot, lightweight gun that sacrifices some size and capacity for a soft shooting experience. In my mind, this is not a bad tradeoff as it addresses some issues that plague some shooters and gives them a mildly compromised solution. Good for S&W. In the end, my only complaint with this package is the .380 round. Everything else is just fine for my money. Eagle Gun Range has the 380 Shield EZ for rent, so take it out for yourself and see what you think. Thanks for the review, Andy. Seems a great choice for those older shooters with arthritis or previous hand injuries. With good quality hollow point Hornady or Speer 95 gr ammo, do you feel this would still not stop threats? As to your question, that’s entirely dependent on the situation, the clothing, and the marksmanship of the defender; as with any situation. The fact is that .380 ballistics are inferior to 9mm ballistics, and more affected by coats and other clothing. That said, the .380 round is generally considered to be a viable defensive round. In the end, the .380 is better than the no-gun at all. You should watch this video on YouTube. Might change your opinion on calibers. Lucas, loved your tag video! After reading this article, I was intrigued in handling one! A friend had bought this exact pistol recently! He showed it to me and I fell in love! So, thank you for an excellent article Andy! A nice video link Lucas! & now, I’m an owner of this .380 EZ! Cant wait to go shooting! Consider also the Ruger LC380. Same concept, better implementation. Cheaper. Your anecdote about the magazine release being pressed and mag coming out seems to suggest that you’re not carrying your pistol in a holster in your purse. Please know that every firearm needs to be in a holster: either a belt holster, a pocket holster, or one made specifically for mount inside of a purse or car. If your pistol is unholstered in your purse, it is a ticking time bomb–one that gets women killed every year. Please make sure to always carry it holstered in your purse. Better yet, never carry in your purse and instead carry on-body. Take care. 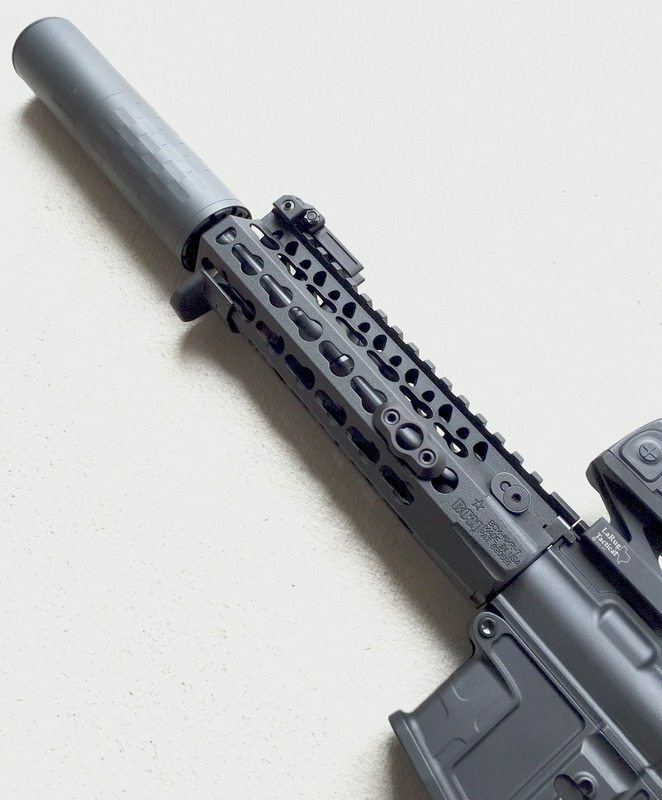 As I understand it, when the grip safety is not depressed the trigger is completely disconnected and the firing pin block is engaged, That being said, what exactly does the thumb safety do? Does it lock the disengaged trigger? The .380 is a vary good defense round. With todays ammo it excels. Bought one for the wife. I had previously purchased a 9 mm Shield for her. She had difficulty racking the slide and unable to clear malfunctions with the 9mm. The 380 Shield EZ solved all of these issues! She loves it handles very well and shoot accurately. I normally carry a Shield 40. I was so pleased with her 380 Shield EZ . I purchased a second one for myself! I can put more rounds on target, more accurately in less time than I can the 40 Smith & Wesson. Just purchased one yesterday at a reputable gun shop/shooting range where they let you test before purchase. This is bar none, the most comfortable firearm I’ve experienced in terms of recoil. I was torn between this and a Taurus 9mm that was comparable in size, but went with this for ease-of-use. I’ll admit that at first I was a little reluctant to purchase as I was in the market for 40-45 caliber, and already own a Glock 17, 9mm. However, this was a truly AWESOME purchase and believe it or not, one of the biggest selling points for me was the easy mag loader which is just wonderful in my opinion. I’m a 37, 265 lb male with a wife who dislikes everything about firearms, so while this purchase is for me…it was also for her and my daughter incase I’m not there and the need is dire. Get some hollows or rip rounds and it’ll get the job done! Just got one for my wife because of the problem of racking and clearing jams. I fired 150rds of three brands of ammo with no problems. I liked the weapon so much I did not want to give it to her. After she fired it she told me to keep my hands off of it. After buying a 380 EZ for my wife I had to come back and buy one for myself. As with my Shield, 9c, and full size M&Ps it just fit and was full-on joy to fire. Now my wife finally has a semi-auto she enjoys and is comfortable with as she trains for her LTC and I’ve got a great summer carry pistol that shares many form factor and operational traits with its 9mm cousins. Small wonder Eagle can’t keep’em on the shelf. Great review. I scoured the www and watched several hours of YouTube videos before finally settling on the EZ for my wife. The trade offs expressed in this article are spot on, although I watched several videos that tested the .380 acp in ballistic gelatin against the 9mm using FMJ and the penetration difference was negligible – about 2 inches. My wife has limited hand strength to rack the slide (fix #1); 9mm is too much recoil for her (fix #2); the pistol is large enough to get good accuracy and enjoy at the range and not be “snappy” like a lot of pocket 380s (fix #3); it has several safety features including a grip safety, ambidextrous manual trigger safety, DAO but with a decent pull weight, firing pin safety – did I forget anything (fix #4); and finally it comes in purple (fix #5) – no, it doesn’t but we are cerakoting it.